Often carers do not consider their own needs, or what support they could benefit from, but here at Pilgrims Hospices, we recognise that carers play an absolutely essential role in the journey of our patients, and we believe carers should be supported throughout this journey. 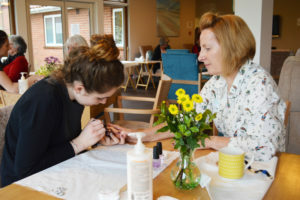 Complementary therapies are very much part of the overall care given to patients and carers in hospices throughout the country. Pilgrims offers a wide range of the most effective complementary therapies available to the family, friends and carers of the people using our services. We offer this free of charge. All of the therapies on offer are designed to support you in mind and body – by helping to ease anxiety and spiritual distress. Whether you choose to try our head massage, body massage, hot stone therapy, reflexology, aromatherapy or Reiki, many carers find these therapies can help with emotional and physical issues they may experience in their caring role. Can I try a taster session? If you are new to complementary therapy or not sure if it’s for you, we also offer an introduction to some of these therapies through our Wellbeing and Social Programme Pamper Days which are available in Canterbury, Ashford and Thanet. All our therapists are fully qualified and have the appropriate professional membership and insurance. 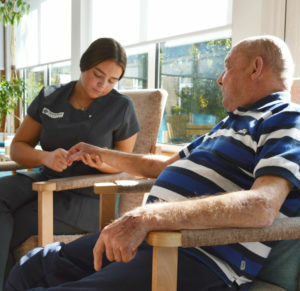 Therapies are given free of charge and are offered to all carers, whether you and the person who is ill are receiving support from one of our Therapy Centres, on one of our wards, at a Pilgrims Outreach Centre or in your own home. Just ask any member of the Pilgrims care team to refer you for complementary therapy. One of our hospice therapists will then contact you to arrange your first appointment. At your first session, your therapist will explain the treatments available to you and discuss which would be most appropriate. They will talk with you about how many treatments you may benefit from and how long the sessions will last. Treatment will only go ahead with your consent and you can stop the treatment at any time should you so wish. To find out more call 01227 459700 or our 24 hour Advice Line for Patients and Families on 01233 504133.